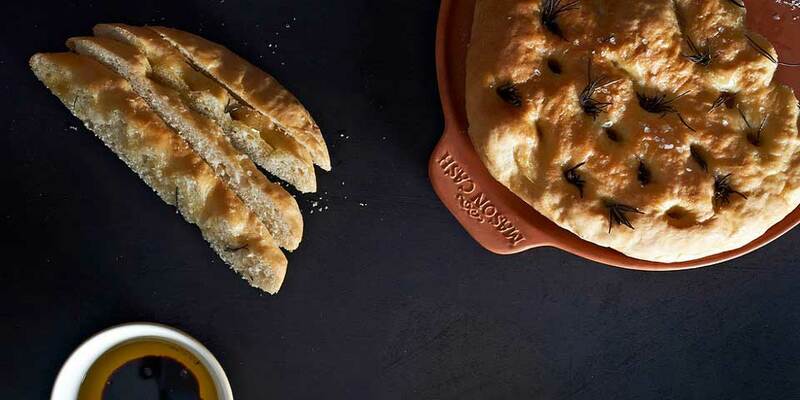 Packed with flavor from sun dried tomatoes and rosemary. Perfect as a starter with deli meats or for dipping with infused oils and vinegar. Tip the flour into your mixing bowl, mixing in the salt then the tomatoes, then the yeast. Make a well in the centre of your mixture and pour in the water and 2 tablespoons of olive oil. Mix with a spoon until it thickens, then use your hands to work into a wet workable dough. Tip the dough out onto a lightly floured work surface and knead for approximately 10 minutes until it is smooth and stretchy. Clean the inside of the bowl and oil it slightly then place the dough into the bowl and seal it with the lid. Allow to rise for approximately 45 minutes or until the dough has doubled in size. Remove the lid and take the dough out of the bowl then knock it back, kneading all of the air out of it. If using a baking stone, place the stone in the oven and heat to 220°C/ 430°F/ Gas mark 7. With a floured rolling pin, roll the dough out into a flat round shape approximately 25cm in diameter. Then punch holes approximately 4cm apart across the surface of your dough using your index and middle fingers. For the dough’s second proving, place it onto a flat baking sheet, cover with a clean tea towel and allow to rise for 15 to 20 minutes. If using a baking stone, using oven gloves, remove the stone from the oven and very quickly place your risen dough onto the stone. Drizzle olive oil into the holes on the surface of the dough, then sprinkle on the sea salt and rosemary sprigs. Bake for 15 to 20 minutes until golden brown or until the loaf sounds hollow when you tap on its base. Using oven gloves, remove the loaf from the oven allowing to cool naturally. Drizzle with more olive oil if desired. Best served with dipping oils or butter.